This post has 3,096 views. This is just a page to list all of the cars I have owned in chronological order. A car is one of the most costly possessions that a person could have, so I thought it’d be fun to document the list of cars that I’ve owned. This is so that I can read this page years later and relive all the fond or not-so-fond memories of the automobiles that I’ve owned, and see how times have changed. The list starts with my first car and ends with my current (or last) car. I bought my first car in my first year of graduate school, and it was an used 2006 Mercedes-Benz ML-350. Before I actually bought the car, I never thought that my first car would be a Mercedes. I always envisioned my first car would be a compact or mid-size Japanese sedan that was reliable and good on gas. While I was looking for my first car, it just so happened that a family friend was willing to let go of this ML-350 for a steal, and the deal was too good to pass up. 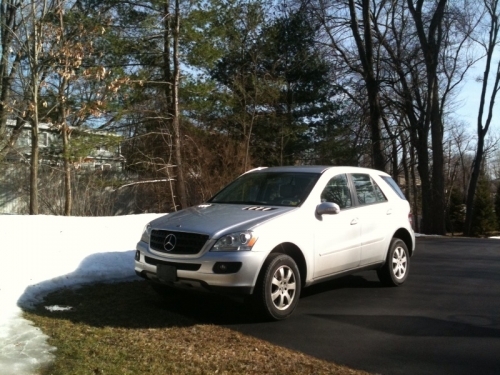 So I ended up with a five-year-old, mid-size luxury SUV, and the car had 81000 miles when I purchased it. It had a silver exterior and grey interior. The car had some cosmetic blemishes from use, but mechanically it was in good shape. The 2006 model is the first year of the second generation ML-class, and it had a 3.6 liter, 268 hp V6 engine mated to a seven-speed automatic transmission and an all-wheel drive (AWD) system. My ML-350 had no optional equipment whatsoever, so it had cloth seats, and it has been the only second generation ML-class that I’ve seen that didn’t have the roof-rails. In a way, that made my car unique. Even though there were no optional equipment, there was plenty of standard equipment like power driver and front passenger seats, dual-zone climate control and other goodies. I liked my ML-350 a lot. The car was roomy, comfortable, had plenty of power and was great for cruising at freeway speeds. I’m a fairly tall guy, but the driver seat had more than enough room for me. When my friends and I went on road trips, we would take my car because of the room and comfort it provides. The car has also been pretty reliable and never developed any problems on its own. The only times it needed repairs was when a rat got into the hood and chewed some stuff up, and also a shock was replaced probably because I drove over a big pot hole. The only downside about the car was the cost of driving and maintaining it. The ML-350 was a bit of a gas guzzler. It can get 20-23 mpg on the freeway, but about 14-15 mpg in city driving for a combined mpg of 16-18. That is running on premium (91 octane or above) gas. The fuel cost wasn’t a big deal for me since I only drive the car on weekends and for fun, but maintenance is what really costs a lot. I take my car to the local Mercedes dealer yearly for maintenance, and every year I pay several hundred dollars even though there was nothing majorly wrong with the vehicle. The ML is the first car I’ve ever owned, and I’ll always have fond memories of it. I probably would have kept this car longer if I could, but unfortunately it was rear-ended in an accident and totaled. The damage wasn’t catastrophic, but the fact that it was an older Mercedes meant that the repair cost outweighed the value of the car, so the insurance company decided to total the car. In total, I owned my ML-350 for almost exactly 3 years, and the final mileage was about 97000 miles. 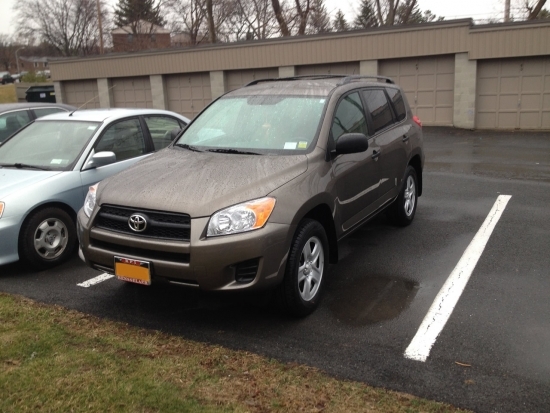 I bought my RAV4 after losing my previous car due to an accident. I had been driving SUVs for 3 years and I like the cargo room and higher seating position, so I wanted to buy another SUV. A new or recent Mercedes or luxury SUV was a bit out of my price range, so I ended up buying a 2011 Toyota RAV4 Base with the Pyrite Mica exterior and the tan interior. The car had only a little over 20600 miles at the time of purchase, and it was equipped four-wheel-drive (4WD) and the 2.5 liter, 179 hp four cylinder engine mated to a four-speed automatic transmission. I bought the vehicle from a dealerships as a Certified Used vehicle, which meant the car came with extra warranty coverage. I had to put in a few thousand more than the insurance payout for my ML-350, but the purchase price was decent as I was able to negotiate the price down a bit. I didn’t want to buy a new car because it was more expensive and new cars depreciate too quickly. Also, I like the look of third generation (2006-2012) RAV4 better than the fourth generation (2013 and newer) RAV4. My RAV4 was in great shape inside and out, and it’s pretty close to a new car as far as I’m concerned. Compared to my ML-350, I gave up on luxury, power and size with the RAV4, but in exchange I got a considerably newer vehicle that was in better shape and had considerably fewer miles, and better fuel economy. The seats are a bit smaller, but I can still fit. Hopefully this car will live up to Toyota’s reputation for reliability and last a good couple of years.